Tuesday marked the passing of an American icon. For just shy of 50 years, Maurice Sendak has been illuminating the minds of children and the adults that love them. His books have been etched into the American imagination; adored not just for their haunting beauty and imagination but most of all, their honesty. Sendak was a master at addressing the raw and complex emotions that all of us (and children most intensely) experience. In Outside Over There, his heroine, Ida is chafed by her new responsibilities as a sister and jealous of her baby sister’s newfound attention. In Where the Wild Things Are, Max tastes the sweet satisfaction of mischievousness but also the loneliness of a king. He never masked the darker side of emotion or glossed it over with sickly sweet sentiment. He magnified it; offering a guileless look at what it felt like to be a child. And perfectly following suit, he assuaged these emotions just the way a child would: with magic and adventure. This was Maurice’s magic. 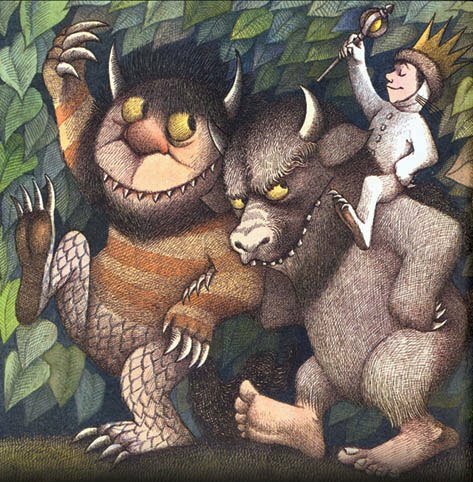 In thinking how best to remember this man, I asked parents of several generations about their experiences reading Sendak’s most famous book, Where the Wild Things Are to their children. Though every story was unique, all highlighted the book’s power to teach children important lessons by speaking their language. One parent loved that the book transforms fear into joy; showing that what’s wild doesn’t have to be scary. Another talked about how it showed that those we might think of as “monsters” are not so different from us. Another appreciated that it made put imagination paramount, telling children to go where their imagination takes them no matter how wild the destination. As one of millions of children shaped by Sendak’s magical realism, I want to say thanks. Thanks for always offering an escape to a world of wonder. Thanks for all the silliness. And most of all, thanks for pushing us to venture out, in our own private boats, into great and unknown waters. As a special treat in memory of a icon, here is some of my favorite Sendack media. Enjoy and let the wild rumpus never end! Art Spiegelman fantastic comic strip depicting his experience meeting Maurice Sendak, published in the New Yorker in 1993. If I could I’d have prints of all the illustrations from Where The Wild Things Are, here&apos;s a few of the best. The trailer for Spike Jonze’s Where the Wild Things Are feature film was an addiction of mine. I watched it probably 20 times in the months leading up to the release. A great scene from Labyrinth which is based on Sendak’s Outside Over There and a childhood favorite of mine. And of course, the famous series of photos showing Pres. Obama animatedly reading Where the Wild Things are at this year&apos;s White House Easter Egg roll.